Many Filipinos are familiar with the Japanese culture. We watch tons of anime and eat lots of Japanese food. 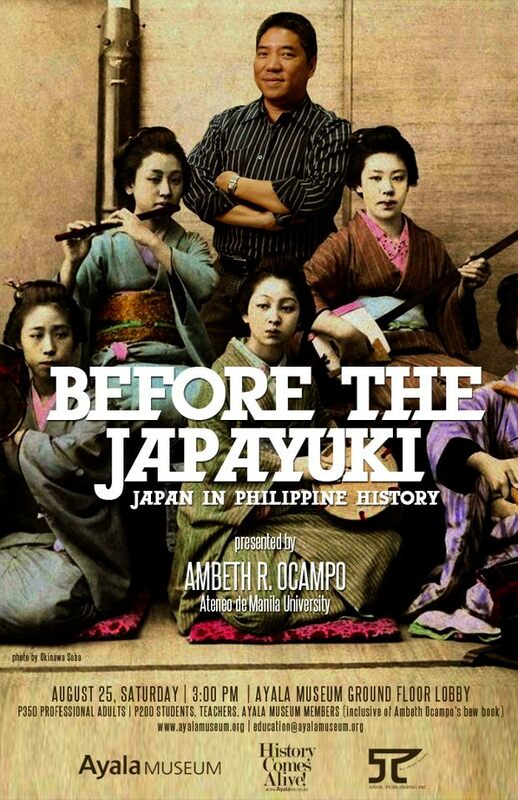 However, when it comes to the intersection of the Japanese history and our own, many Pinoys are limited to talking about World War II or some girl they know who became a Japayuki (a term which originally referred to Filipinas who went to Japan to be cultural entertainers but later came to refer to Filipinas who went there to prostitute themselves). In Ambeth Ocampo's recent lecture titled "Before the Japayuki: Japan in Philippine History", I learned about the karayuki-san. They were poor Japanese girls who went to East Asia and Southeast Asia (including the Philippines) to work as prostitutes during the 1800s. According to a Japanese sociology blog, many of these girls did not really set out to sell their bodies, but were made to believe by mediators that there were many good working opportunities in other countries and that they could make enough money to support their families. Heavily indebted to the mediators for transporting them out of Japan and not knowing the language of their destination countries, they were forced to work as prostitutes to pay off their debts and to be able to send money to their families. This bit of info reminded me of how progressive the Philippines was during our parents' and grandparents' time, when poor people from other countries would go here to seek a greener pasture. What the hell happened? Now millions of Filipinos have scrambled and are scrambling to get out of the country in the hopes of having a better life. We're slaves/employees of foreigners whether here or abroad. Tsk tsk! Back to the Ambeth Ocampo lecture. Ambeth also discussed more connections between the Philippines and Japan, some of which were gleamed from "useless information". For example, here in the Philippines we call all bottle caps as tansan but Tansan was a brand of Japanese mineral water that supposedly warded off indigestion and stomach troubles. Some things have a more obvious connection, such as the rock-paper-scissors games we call Jack en Poy (called Janken Pon in Japan) and the mosquito coil we locally call katol (called katori-senkou in Japan). Another connection lies in our favorite dessert halo-halo. We like to think of it as uniquely ours but it's not -- our neighboring countries also have their own versions of this famous dessert (I once tried the Thai halo-halo but didn't like it much, I still prefer our version). Halo-halo most likely originated from the Japanese cooler called kakigori which is made from shaved ice and sweet syrup and which has been existing since at least the 10th century. If it's any consolation, Ambeth confirmed that the "Pinoy pride" dish adobo is indeed Filipino, and not Spanish as some people think. The name, which refers to the process of cooking rather than the actual dish, was Spanish in origin since the Spaniards who ate it forgot its real name. Christianity also linked Japan and the Philippines. Back when Christianity was banned in Japan, several Japanese noblemen were exiled here. The Filipino saint Lorenzo Ruiz was also one of the Christians killed in Japan for refusing to renounce his faith. Japan also played a big influence on Jose Rizal. Rizal was fascinated with Japanese art and even drew Japanese-style. He also admired the paper walls typical in Japanese houses and contrasted the low crime rate there against the high crime rate in the Philippines despite our use of wood and bricks to make houses. Then of course there was Seiko Usui, more popularly known as Osei-san. As with Ambeth Ocampo's previous lectures held in the Ayala Museum, this one was well attended. Entrance fee was P350 (P200 for students, teachers, and Ayala Museum members), with a complimentary copy of his book Looking Back 5: Rizal's Teeth, Bonifacio's Bones.